The service drop is 8 ft. off the ground. Ironically the Grounded Conductor is the highest one... The PoCo and Inspection requirements make this a financial disaster... the trumpet vines are an interesting touch... All natural GEC? why the separation of conductors? Doesn't PoCo use triplex drops? Yeah, they use triplex now, but not 50 years ago when this was installed. 5 months ago, an upgrade to 200A would not have required a feed-thru disco, additional ground rod, and ubiquitous $75 inspector visit. Could've gotten underground at no extra charge, too. Now the customer owns the drop/lateral. It's more cost effective to take the risks, which is a problem I've been trying to describe in other posts as well. I'm not the only homeowner around here "forced" into this decision... just more educated in the electrical field than most homeowners, so I'm more aware of the risk. i don't suppose you can just do a mast kit down to the existing meter?, or will the AHJ require all-or-nothing? i suppose as an electrician you can wieght what the risks are, truth is we all do risk vs. $$$ everyday. If the meter is pulled for anything above a main breaker replacement, the AHJ must approve before the PoCo brings the juice back on. Does the drop cross any driveways or roads? What is the height there? Was this always like this or was there some modification or event that made it so low? The drop is as originally installed. It goes over a farming machinery access road/driveway. Should have 12 ft. minimum clearances, (I'd like to see 15') so the corn chopper doesn't snag it. 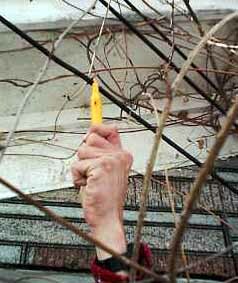 Failed to mention the bare conductors where the vines have deteriorated the insulation. I've added 130C tape to the bare spots.